The ability to stream 4K content is high on everyone’s list. 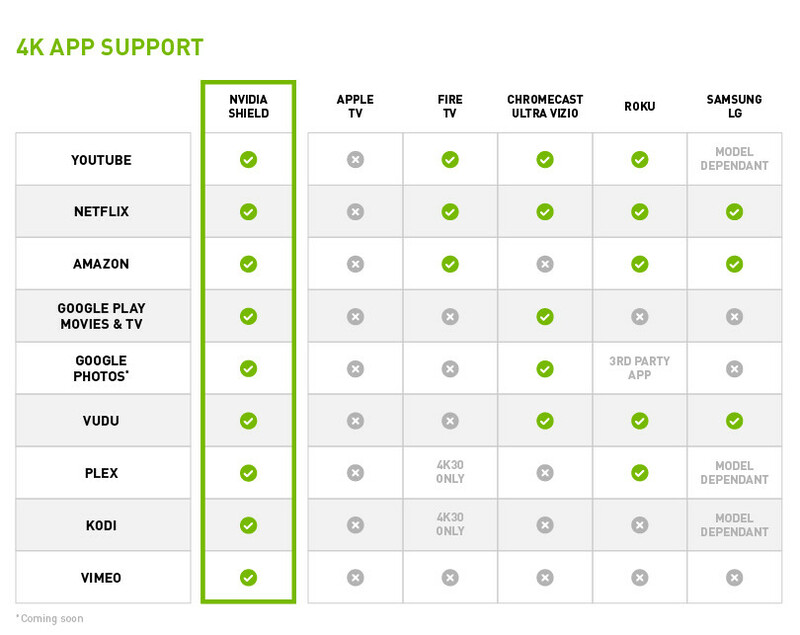 And when it comes to viewing 4K movies and tv shows, you can’t do better than NVIDIA SHIELD. Powered by the NVIDIA Tegra X1 processor, which supports a plethora of high-end features, NVIDIA SHIELD is hands down one of the best players for streaming 4K content. But enough about the speeds and feeds! You just got your hands on the new SHIELD TV and a new 4K TV and want to know which apps on SHIELD are the best for viewing 4K content. Don’t worry! We got you! Google Play Movies & TV - Whether you are looking to rent or buy a recent release movie or TV series, Google Play Movies & TV has you covered. This app sports the largest catalog of new release 4K content from the most production studios: Warner Bros., Fox, Universal Pictures, Sony Pictures, Paramount, and more. For a list of their latest 4K Ultra HD movies, click here. Amazon - With Amazon Video, SHIELD owners can stream popular movies and TV shows including Amazon exclusives like “The Grand Tour” and “The Man in the High Castle” in 4K HDR resolution. Prime members in the US can even sign-up for and stream videos from channel subscriptions including HBO, SHOWTIME, STARZ, and dozens more. YouTube - When it comes to watching free 4K content it’s hard to beat YouTube. The Google-owned YouTube rolled out support for 4K content a couple years ago but now there’s more 4K content than ever. YouTube also recently released support for 4K livestreams. And SHIELD supports YouTube 4K playback up to 60 frames per second for the smoothest viewing experience. VUDU - With support for Dolby Atmos audio and an an ever-growing 4K content library, SHIELD owners can instantly watch hits like “Creed,” “Good Dinosaur,” “Spectre,” “Supergirl” and more. VUDU also supports UltraViolet and Disney Movies Anywhere movie playback. Plex - Simply put, Plex is one of the easiest ways to access and enjoy your 4K content on SHIELD. With the addition of Plex Media Server on SHIELD last year, the experience was taken to a whole new level. A centralized home media playback system, SHIELD users can also enjoy Plex Channels, which lets you access free and complete 4K content streamed from popular sites across the Internet. Kodi - Kodi is a free, streaming media center app that allows users to stream TV shows, movies, pictures, music, and other digital media from local or network storage as well as the Internet. The Kodi app is hands down one of the best ways to stream ANYTHING to your SHIELD TV. And SHIELD is by far the best device for Kodi. Including 4K content! Vimeo - An anagram of the word “movie,” Vimeo has been around since 2004. Serving as a relatively high-definition counterpart to YouTube back in the early days, Vimeo rolled out its support for 4K content in 2016. Pluto TV - Watch 100+ TV channels handmade for the Internet, free on SHIELD TV. With favorites like news, music, comedy, drama or try Pluto TV exclusive channels like FailArmy, Classic Toons and yes...Cats 24/7. Pluto TV’s ever-expanding catalog of 4K content includes staples from news to fashion, and partnerships with some of the best content creators on this planet. UltraFlix - Boasting a large library of 4K Ultra HD content, UltraFlix is a streaming network that enables subscribers to choose from more than 600 hours of 4K Ultra HD Video on Demand content in a broad range of genres. UltraFlix also has more than 100 hours of free 4K content. VLC - A free and open source cross-platform multimedia player, VLC media player plays most multimedia files as well as discs, devices, as well as network streams and DVD ISOs. MX Player - Similar to VLC, MX Player is a free, open source multimedia player that has the ability to play nearly every type of multimedia file. Curiosity Stream - Fans of documentaries will love CuriosityStream. With content designed to “enlighten, entertain, and inspire,” with CuriosityStream, SHIELD owners can watch documentaries from many of the world’s top filmmakers. With a wide array of topics covering everything from science and technology to nature and history, you’ll find that CuriosityStream is well worth the monthly fee. Plans start at $2.99 / month and the first month is free. Toon Goggles - Toon Goggles is a a great Android TV app that lets kids watch both “kid-safe” and “parent-approved” content including cartoons and music from the comfort of their couches with SHIELD TV. With an ever-increasing library of 4K content, Toon Goggles boasts hundreds of fun and educational cartoons as well as live action shows and millions of popular songs from famous artists such as One Direction, Taylor Swift, and Selena Gomez via the new Tune Goggles Radio feature. Toon Goggles is free but Toon Goggles Premium, which offers unlimited viewing to their entire catalog is $4.99 / month. If you don’t already own one, pick up an NVIDIA SHIELD TV today.